In the past decade, the developed world has spent almost US$ 2 trillion on foreign aid for poorer countries. Yet 1.2 billion people still live in extreme poverty and around 2.9 billion cannot meet their basic human needs. But should rich nations continue to help the poor? 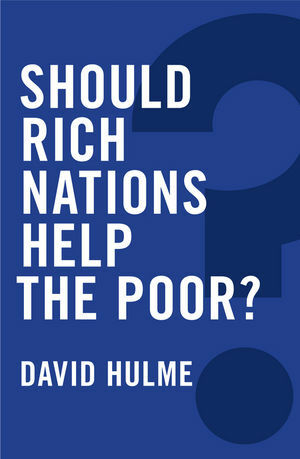 In this short book, leading global poverty analyst David Hulme explains why helping the world’s neediest communities is both the right thing to do and the wise thing to do Ð if rich nations want to take care of their own citizens’ future welfare. The real question is how best to provide this help. The way forward, Hulme argues, is not conventional foreign aid but trade, finance and environmental policy reform. But this must happen alongside a change in international social norms so that we all recognise the collective benefits of a poverty-free world. 1-Why Worry About the Distant Poor? 3- What Can Be Done? "The impulse to assist poor people in poorer countries appears weaker than it has at any time in the recent past. In this slim volume, David Hulme presents the case in support of global connectedness (albeit with some reforms and course corrections) and reinforcing foreign aid (but with significant modifications). This persuasive polemic, smoothly flowing and accessibly presented, is well worth a read. The essential humanity that permeates the narrative is uplifting." "Hulme addresses this complex topic with clarity and provides a platform for further discussion about future development initiatives. The book is therefore a good resource for development practitioners, planners and policymakers."